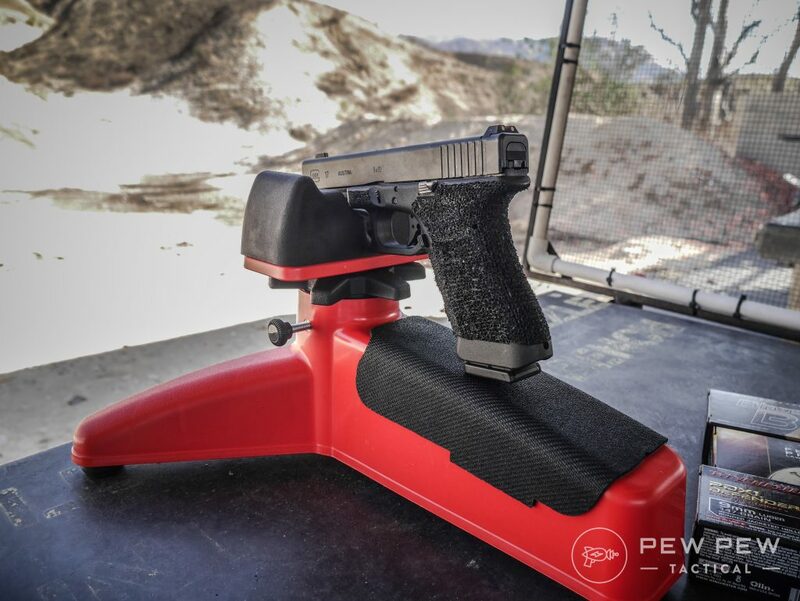 Want your new Glock project to both shoot AND look better? 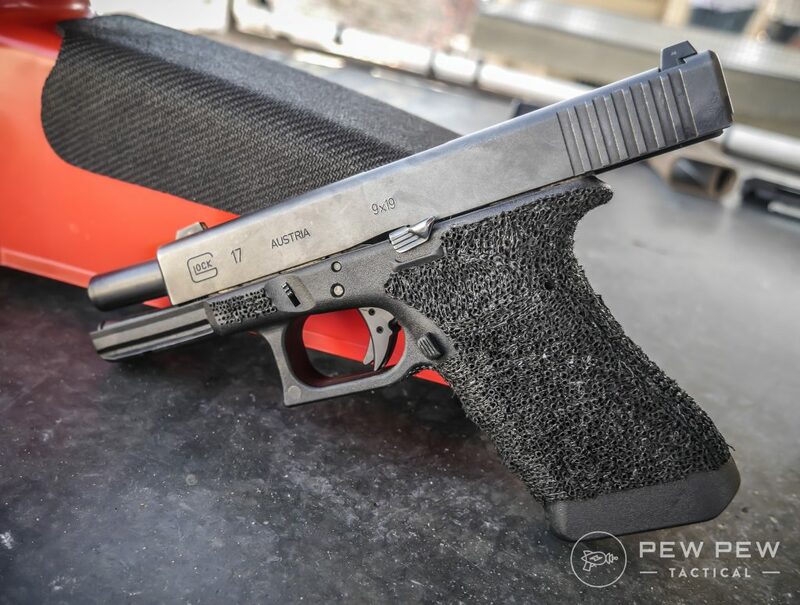 We’ll cover Faxon’s series of Glock barrels that come in both Duty and Match accuracy…plus hot looking finishes that will make your Glock one of a kind. 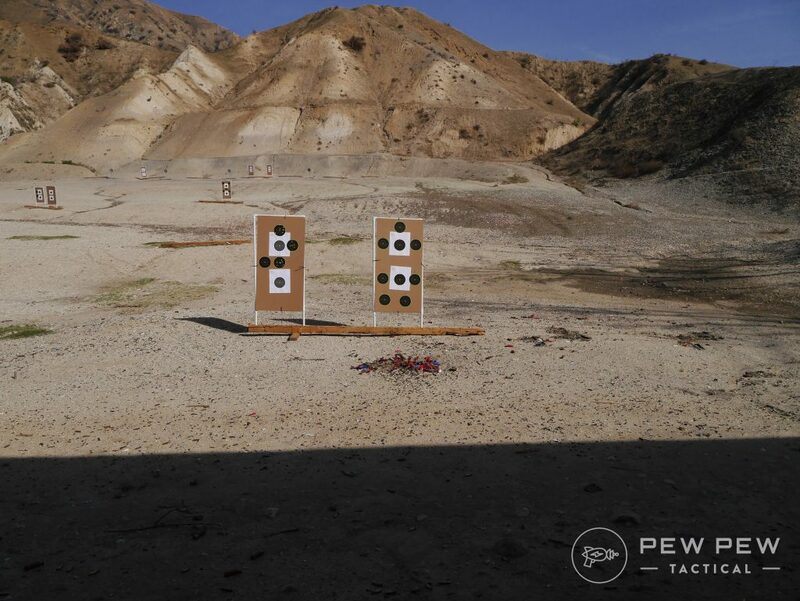 Of course, we pitted it against a stock Glock barrel across a couple plinking and self-defense brands. I really like their AR-15 barrels. They have a great reputation for being the best bang-for-the-buck barrels. Guess it helps when you make all your own barrels in house! 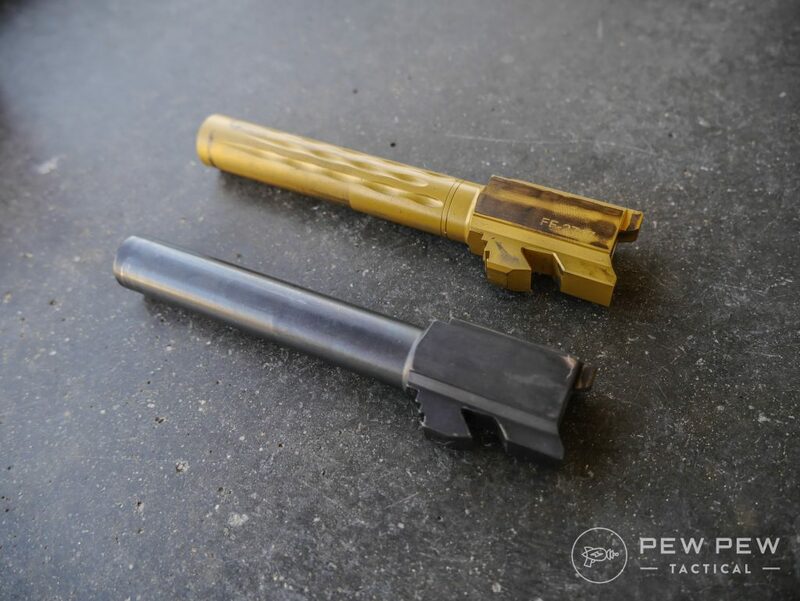 Here’s a review of their 14.5″ pencil barrel with a permanent muzzle brake. It shot great and the brake is the same diameter as the gas block…meaning you can take it on and off. Couple their barrel and my other favorite Best AR-15 Upgrades, and you can build some sweet ARs. They sent me this Glock barrel for me to test out for my honest review. And test it out I did! 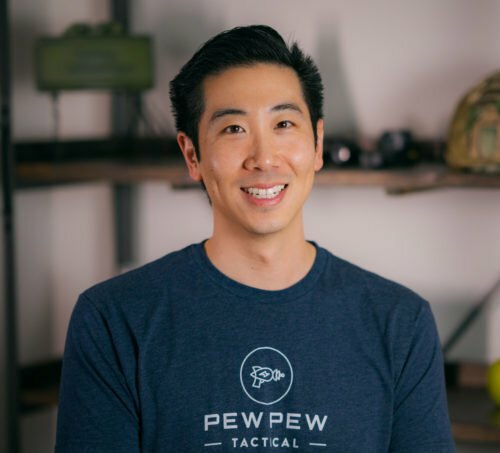 Plus…they are hooking up Pew Pew Tactical readers with a 10% off coupon (find it at the end of the post). 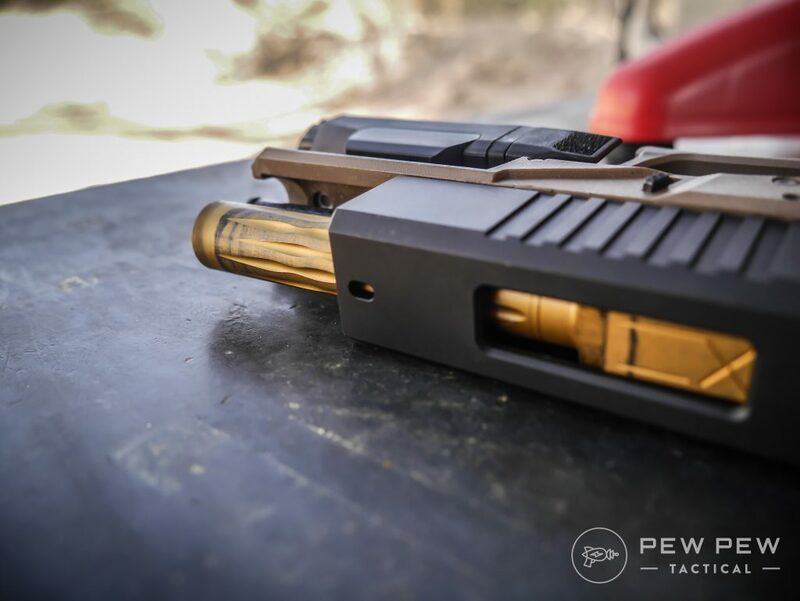 The barrel I’m specifically testing out is the Glock 17 (full-size), flame fluted, TiN (gold colored titanium nitride), un-threaded, and Match series. Unfluted, threaded, and either Duty or Match (more accurate). Fluting reduces the weight a little but is more for increasing the rigidity of the barrel, and thus the accuracy. It fit just like a stock barrel into all the slides I tested…a stock Glock 17, Grey Ghost Precision slide (review), and Brownells windowed slide ($160) where it’s going to stay. 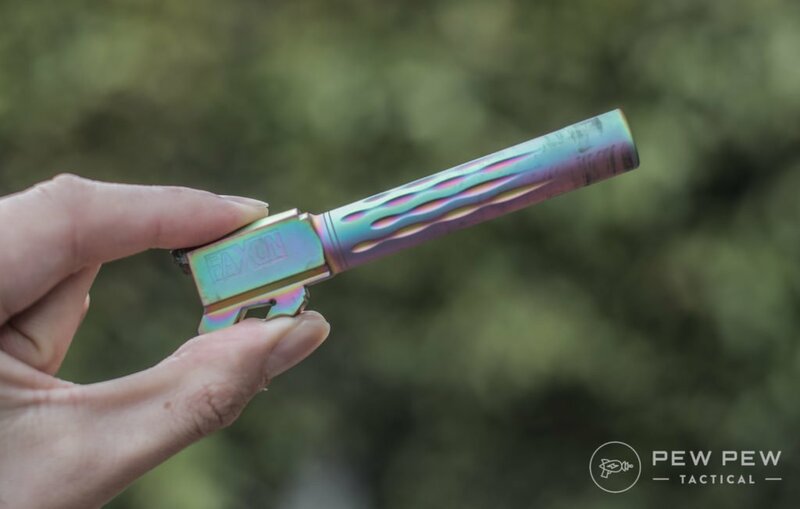 The TiN coating is even and looks great…especially if you have a window-ed slide like the Brownells. Sometimes…if it doesn’t look cool…what’s the point. Not as easy as testing AR-15 barrels where I can get a reasonably stable platform, sweet optics, and a super nice trigger. I’m making do with a lightweight handgun rest ($25). But to make it as controlled as possible, I’m using my competition G34 frame which has my favorite Glock trigger, the Zev Fulcrum Ultimate ($250), and a stock Glock 17 slide with factory night sights. The targets are 10 yards away and I’m using a variety of my favorite plinking ammo. Plus some self-defense ammo. 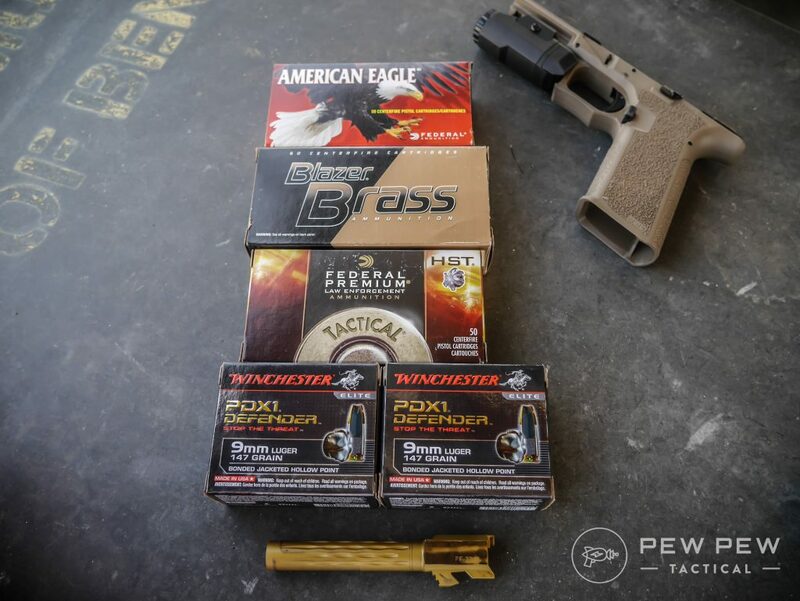 If you’re looking at more 9mm ammo, check out my Best 9mm Ammo article. I ran 100 rounds through the barrel and let my buddies shoot as much as they wanted through the barrel in my Polymer 80 build (guide coming soon). I’d estimate about 250 rounds until I started to test for accuracy. No cleaning was done. 10 round strings, shots about every 5 seconds, and about 5 minutes between strings for cooldown. 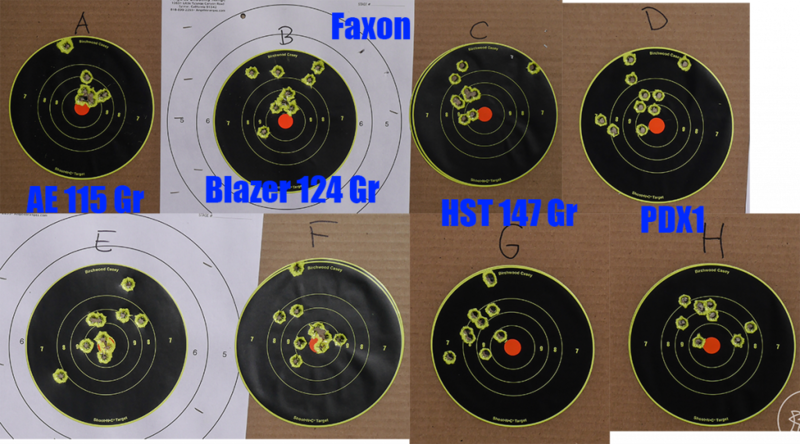 Here are the results (top 4 targets are Faxon, bottom 4 are stock Glock). Next time I will put the same barrel on the same line so I’m not cut & pasting. I realized I had an empty top target, so I put the Faxon barrel into my P80 build. 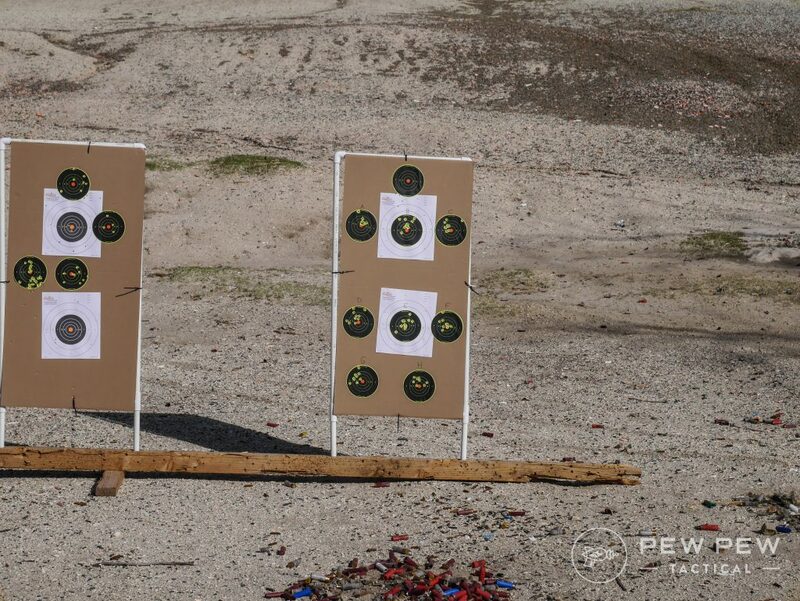 Results are largely the same with the best groups from the lighter 115 gr. Off target shots should be from my rifle testing previously. No failures in the couple hundred rounds I put through it. Fits like a stock barrel in all three slides I’ve tried. I can see a noticeable difference between the Faxon match barrel and the stock Glock 17 barrel…especially when shooting 115 gr. I think it looks pretty great in my windowed Brownells slide. Next build might use the Chameleon color! Faxon does it again with its barrels. A stock Glock 17 barrel is around $140 while the TiN coated and flame fluted I used was $210. If you want it threaded, it’s another $10. Glock 19 barrels are a little cheaper and G34 barrels a little more expensive which makes sense. 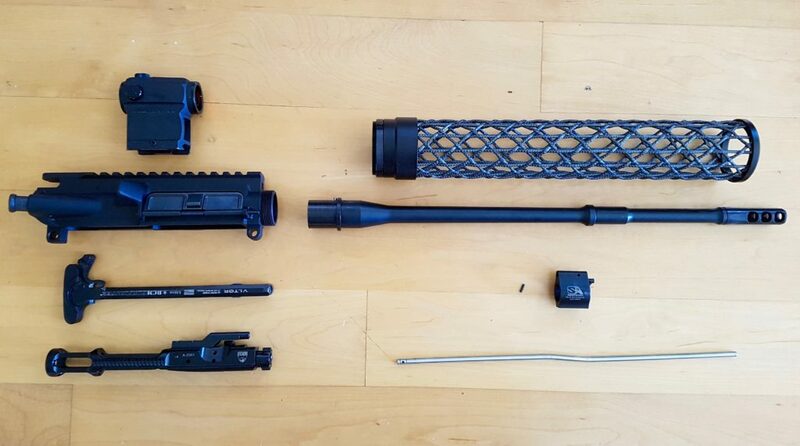 I highly recommend Faxon’s Glock barrel for your next build or upgrade. 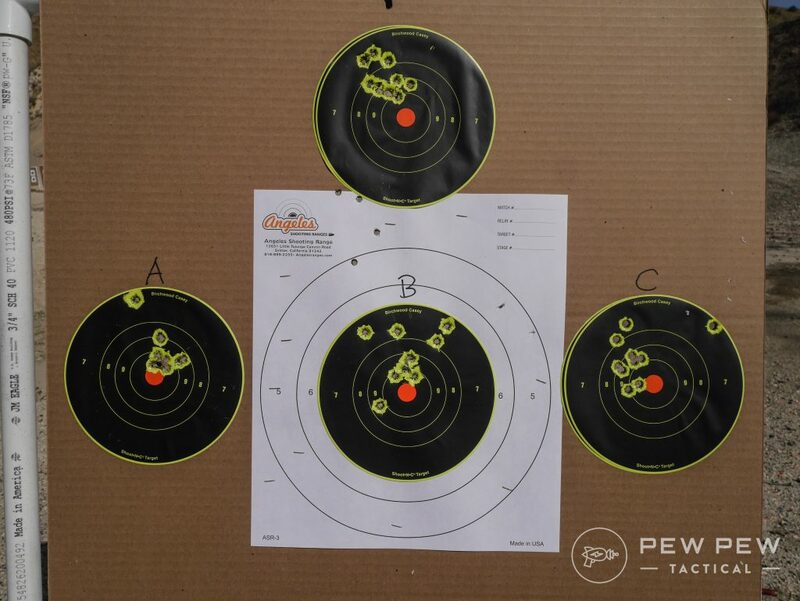 There’s a noticeable difference in accuracy from my testing…and it seems that for my barrel at least, you might maximize the accuracy with lighter 115 gr bullets. PLUS…it looks awesome if that matters to you. 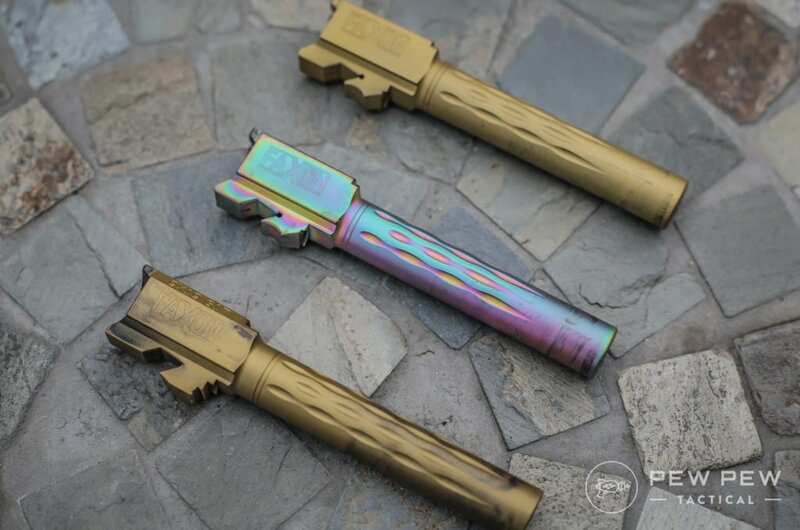 But if you’re not looking to pimp out your gun…they still have black barrels that are all business with fluting and match quality. I’m looking forward to putting hundreds if not thousands of rounds through it the next couple of months with range sessions and competitions. I’ll update if anything happens! What do you think? Are you considering Faxon for your next build…or is there another barrel manufacturer you want us to check out? What evidence are you useing to support “faxson more accurate”? Counting the outer most ring (in 4vs 4 picture), faxson has 12, standard has 7ish. I can’t notice a difference in grouping, so what makes it more accurate? A fluted barrel is not stronger than an unfluted barrel of the same diameter. Given that the barrel diameter of a Glock is limited by the slide you gain no advantage from fluting. If however you were to increase the diameter and could modify the slide to occomodate it, fluting could be use to keep the barrel mass the same so as not to throw off the timing of the guns cycling. 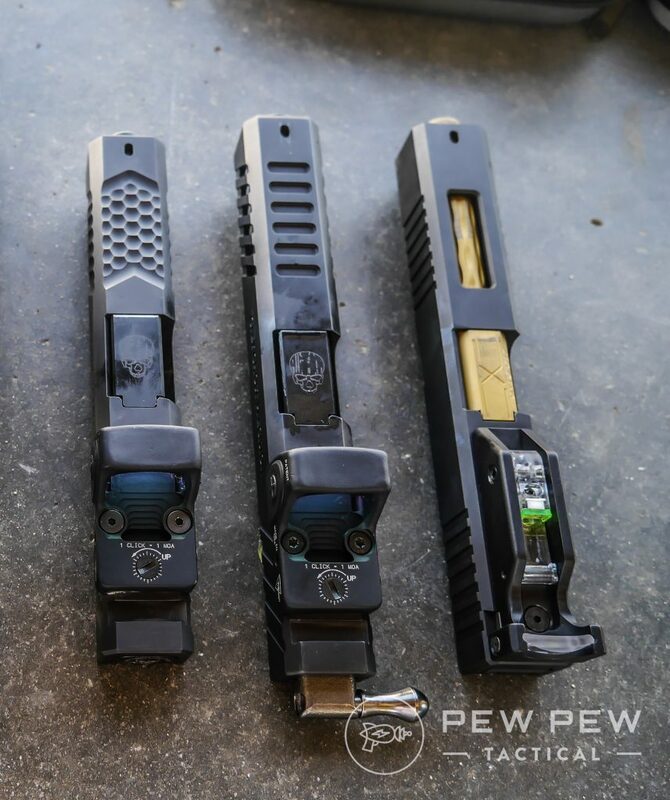 What RMR do you have on the brownells slide? I was under the impression only the Trijicon RMR fit them? Hi John, sorry I missed this comment from a while back…it’s a See-All Sight with a magnifier and a small tritium lit reticle (full review). Is there a version that is threaded for suppressor or compensator use? Well, ……. those barrels sure are purdy; but for that kind of money you could (almost) buy a truly accurate Bar-Sto Precision barrel. I’ve got 3 Glocks fitted with Bar-Sto barrels; and they are phenomenal shooters! The TiN coating seems nice, though.